A lone bell tolls from somewhere close by, not an unfamiliar sound when you’re in Italy, but at this moment it’s rather more poignant. I’m inside Ferrara’s ancient synagogue, still going strong in the heart of the former medieval ghetto, nearly 600 years after it was built. Tonight though it’s completely rammed, standing room only for the Friday night service and Rabbi Luciano Caro is beaming from ear to ear. Is Emilia-Romagna Italy’s Jewish heart? 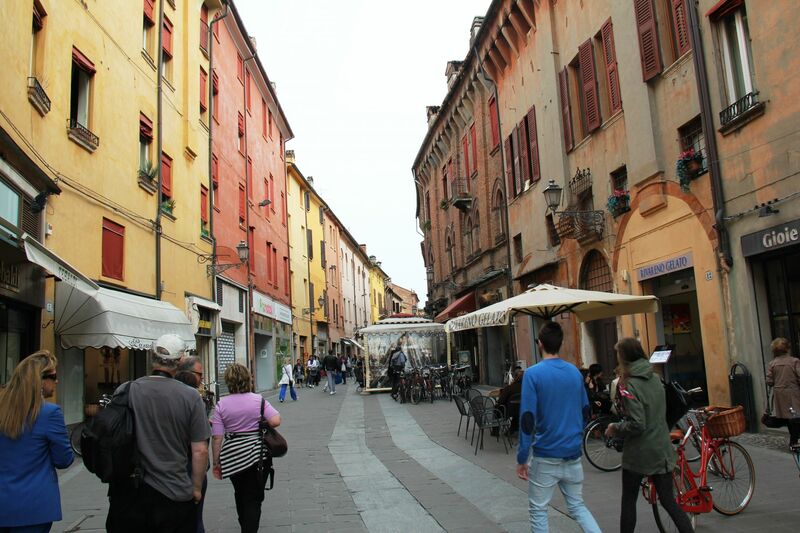 This region is a veritable treasure trove of Jewish history, and the cities of Bologna, Cento and Ferrara in particular, owe their very existence to their Jewish communities. Whilst Rabbi Caro might not enjoy a full house every week (this particular weekend, the city is hosting the annual Jewish Book Festival) Ferrara’s Jewish community has long played a key role across the whole region of Emilia Romagna. Rome’s Jewish provenance is said to be directly linked to the people of Judaea, however it’s the diversity of Emilia-Romagna’s Jewish communities and the social and commercial impact they achieved that prompted the state to pick Ferrara as the location for a new National Museum of Italian Judaism and the Shoah (MEIS). 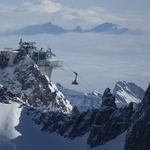 Set to open fully in 2016 in an impressive new structure on the via Piangipane, it promises to become the definitive chronicle of Italian Jewry. Emilia-Romagna borders Liguria, Lombardy and Tuscany, and it’s a region said by those in the know, to have the best food in Italy. Not surprising when you consider it’s the home of Balsamic vinegar in Modena, Parmigiano-Reggiano in Parma and the stomping ground of Pellegrino Artusi, the man dubbed as the grandfather of Italian cuisine. When you add in the stunning cities of Bologna, Ferrara and Ravenna and legendary names like Ferrari, Lamborghini and Ducati you realise this is a region to take very seriously indeed. 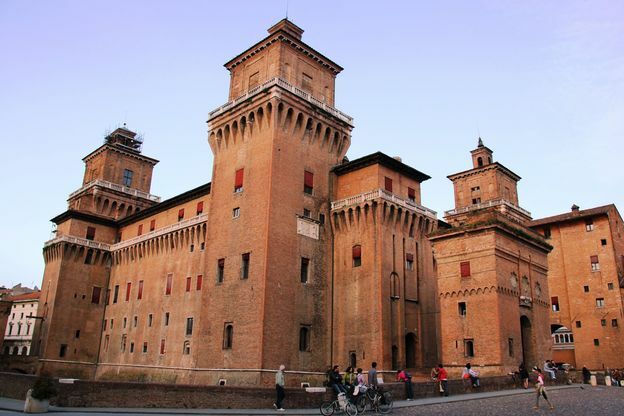 Ferrara is dominated by the huge Castello Estense, the 14th century home of the powerful Este dynasty, which included Lucretia Borgia and the medieval ramparts that still circle the city are a pointer to its importance throughout the middle ages. 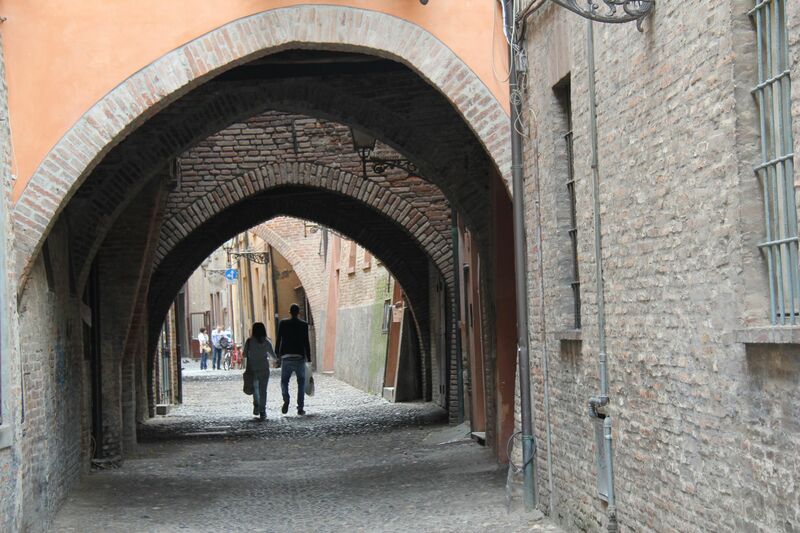 Back then, the famed Po River literally lapped the streets of the city, and today, down by the via Delle Volte, you can still see the raised archways linking the ancient vaults and walk the narrow cobbled alleyways. I take a stroll around the ghetto quarter, created in 1627 after the Este dynasty fell, and find it still pretty much intact, the remnants of two of the five gates sealing off the area after dark, still attached to the walls. Many of the restaurants here still have what is termed “Jewish food” on the menus (although not Kosher) Ferrarese burriche pastries, spelt soup and ricciolini pasta at Yom Kippur. I wander down via Mazzini just off the main square next to the cathedral and find the old synagogue at number 95. Actually, there are three synagogues here, but the other two are used as small museums these days. Walking or cycling along the remains of the ramparts, all 9 kilometres of them, is a great way to see the different aspects of this beautiful renaissance city, stopping off to explore interesting little corners. One in particular is a must see; the Jewish Cemetery, and tucked away in one corner I find the grave of Ferrara’s most famous Jew, writer Giorgio Bassani who penned the novel “The Garden of the Finzi-Continis.” There are regular “Bassani walks” where you can join a group walking in the great man’s footsteps around town, stopping every so often to hear an extract of his novel. The cemetery is a sprawling space, but full of large grassy areas noticeably stone free. The marble and stone was taken by the Inquisition in 1750 to build the left hand pillar on the Palazzo del Municipio opposite the cathedral. On my way out of the cemetery I spot two stone slabs side by side inscribed with the name Ottolenghi and wonder if these are perhaps descendants from the Israeli chef we all know? It’s under an hour to get to Bologna from Ferrara, but Cento is worth a diversion. At one time, Cento was the centre of hemp making and supplied it to the Royal Navy in bucket loads. The family Disraeli was a major benefactor of this custom and lived in Cento’s small ghetto for many years before emigrating to the UK even though they amassed great wealth. Today the ghetto has been fully restored, the original18th century balconies overlooking a web of interconnecting courtyards. Bologna, in my opinion has it all. An underrated Italian gem, perhaps still hiding under the shadows of Florence and Rome, Bologna has so much to offer. It has the oldest university in the world, over 40 kilometers of porticoes ranging from ancient wooden to renaissance splendour, too many historic buildings to count and a rich history of gastronomy that dates back to the middle ages when it was dubbed ‘Bologna the Fat’. Top of the that particular list is handmade tagliatelle and tortellini always with a ragu sauce (never mention the word Bolognese in these parts). Food markets abound in Bologna so take some time to wander around and marvel at the fresh fish and vegetables on display. The 16th century ghetto area adjacent to Bologna’s famous medieval twin towers, the nearby synagogue, still used by the 100 odd members and the Jewish museum in a 17th century palace on Via Valdonica, all offer up yet more images of the city’s rich Jewish heritage. 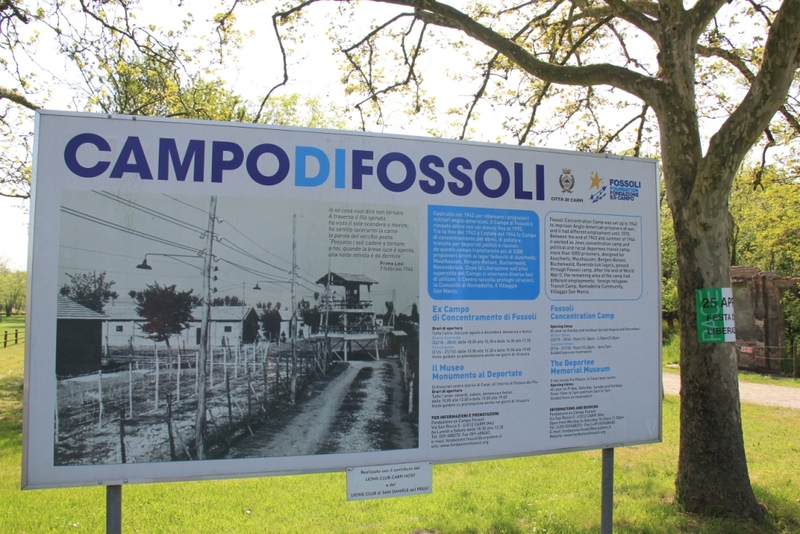 If you have time left, close the circle on your Jewish tour of Emilia-Romagna and visit the concentration camp at Fossoli near Carpi. From 1942-1944 it deported nearly 3,000 Jews to German camps including the famous Italian writer Primo Levi. 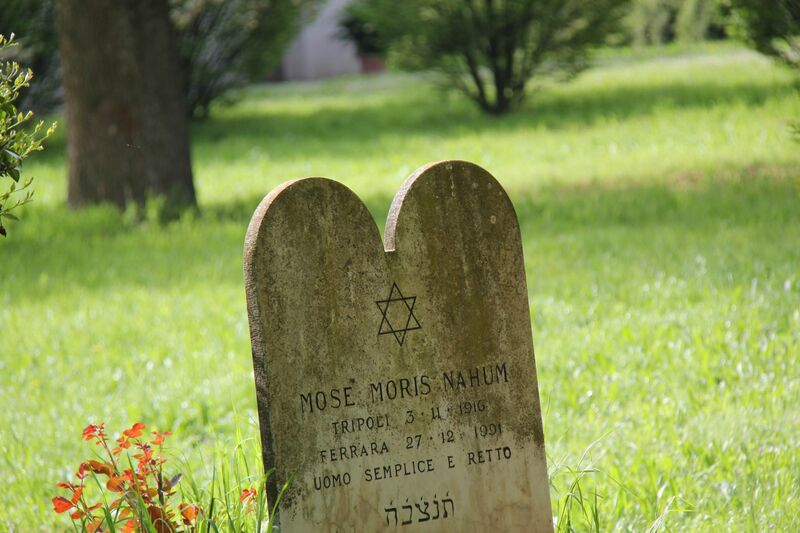 My tour of Jewish Emilia-Romagna opened my eyes to a region that, in the most part, lovingly embraced its Jewish community. Rabbi Caro still does of course, whenever he possible can. 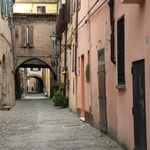 How can I get to Emilia-Romagna and find out more on its Jewish history? Getting there: BA, EasyJet and Ryan Air all fly direct to Bologna from £125 return. 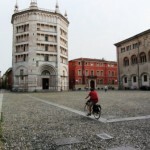 Parma. italy. Prosciutto and Parmigiano heaven.